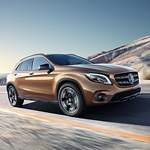 Mercedes-Benz GLA 250 SUV Technology Features | i.g. Burton & Co. Inc.
Get in the new Mercedes-Benz GLA 250 SUV for a test drive to see why this luxury subcompact SUV has been growing in popularity this year. The Mercedes-Benz GLA 250 has a rearview camera for helping improve visibility when you are backing up. Simply place the vehicle in reverse. Look as the screen on the center console turns into a camera monitor, allowing you to see everyone and everything that is moving directly behind your vehicle. If you struggle with parking in tight spaces, you'll definitely appreciate the Enhanced Active Park Assist in the new Mercedes-Benz GLA 250. Activate the feature, let go of the wheel, and the vehicle assists by steering you into the spot while you simply control the braking, shifting, and use of the gas pedal. Test drive this Mercedes-Benz GLA 250 today because here at i.g. Burton & Co. Inc. we have them waiting on the lot for you.